Lightly spoon flours into dry measuring cups; level with a knife. Combine all-purpose flour and next 5 ingredients (all-purpose flour through cinnamon) in a medium bowl; stir well. Make a well in center of mixture. Combine juice, oil, rind and eggwith a whisk; add to flour mixture, stirring just until moist. Stir in raisins. Spoon batter into 12 muffin cups coated with cooking spray. Sprinkle evenly with 1 tablespoon sugar. Bake at 400 degrees for 20 minutes or until muffins spring back when touched lightly in center. Remove from pan. Cool completely on a wire rack. Preheat oven to 350 degree F. Grease and flour loaf pan (9x5x3"). Set aside. Combine flour, sugar, baking powder, baking soda and salt. Mix in remaining ingredients except berries. Beat until smooth. Fold in frozen blackberries. Keep berries frozen when added to batter to prevent juices from turning cake purple. Spoon batter into prepared pan. Bake 60 minutes or until a wooden toothpick inserted in the center cake comes out clean. Cool 5 minutes and remove from pan. Cool completely. This easily prepared cake will be very dense and is perfect with a cup of coffee or tea. The whole wheat gives a unique texture and taste. Assemble blender. Put all ingredients into blender container in order listed. Cover and process at blend until smooth. Use electric crepe maker following manufacturer's directions or preheat lightly greased saute pan. Pour in enough batter to cover bottom (scant 1/4 cup or 50 ml); tilt to spread batter thinly and evenly. Flip crepe when bottom is browned and top is set. Brown second side. 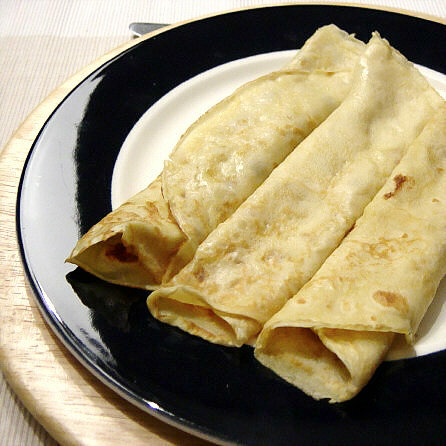 To keep for later use, separate crepes with waxed paper, wrap, and freeze. 20 to 25 crepes. "This is an adaptation of Italian focaccia. It is one of the most crispy and crunchy crackers, as well as one of the most substantial. Try serving Focaccia Crackers with soft cheese or garlic-flavored cream cheese. It is somewhat more difficult to make than most other crackers, but worth twice the trouble. 375~F. 20 to 30 minutes. In a small bowl, combine the yeast with the sugar and 1/4 cup of the warm water. Set aside in a warm place until the mixture starts to foam, about 5 to 10 minutes. Combine the flours and salt in a large bowl or in the food processor. Cut in the shortening until the mixture resembles coarse meal. Stir in the yeast mixture and the remaining 1/2 cup warm water. Blend to form a dough that will hold together in a cohesive ball. Knead well by hand for about 10 minutes on a lightly floured surface or by pulsing about 25 seconds in the food processor. Knead until the dough is smooth and springy to the touch. Place the dough in a lightly oiled bowl and turn it over to coat all sides. Cover with a damp towel and set the dough in a warm place until it has doubled in bulk, about 1-1/2 to 2 hours. Punch the dough down and turn it out onto a lightly floured surface or pastry cloth. Roll it into a rectangular shape approximately 1/4 inch thick. Place the dough on a lightly greased or parchment-lined baking sheet, cover with a damp towel, and let it rise for another 35 to 45 minutes. Using both hands, gently push your fingertips all over the top of the risen dough, leaving indentations throughout. Cover it with a damp towel again and put in a warm place until doubled in bulk, about 1-1/2 to 2 hours. Preheat the oven to 375~F. With your fingers or a soft pastry brush, lightly brush the top with olive oil. Bake for 20 to 30 minutes, until very crisp. Cool on a rack. When cooled, break into small, irregularly shaped pieces, or into 2 large crackers that can be broken off as they are nibbled. 5. Bake at 400 on a baking sheet sprinkled with cornmeal, until golden - appro ximately 15 minutes. In a medium bowl, cream together the margarine, white sugar and brown sugar until smooth. Stir in the vanilla and eggs. Combine the whole wheat flour, all purpose flour, baking soda and salt, gradually blend into the creamed mixture. Fold in chocolate chips and walnuts if desired. Drop by rounded spoonfuls onto the prepared cookie sheet. Bake for 8 to 10 minutes in the preheated oven. Allow cookies to cool on baking sheet for 5 minutes before removing to a wire rack to cool completely. For bar cookies, press dough into a 10x15 inch jelly roll pan and bake for 12 to 15 minutes. This recipe is made for a bread maker. All ingredients should be placed in the pan in the order shown.